Practicing in his backyard as a teenager, Ryan Klesko honed his skills delivering 90 mph baseballs to his mother from a mound she had dug for him when he was 9, according to The South Florida Sun-Sentinel. On this day, in October 1995, Klesko wished he could deliver her another baseball, one of the two he hit over the fence at Cleveland's Jacobs Field, one each in Games 3 and 4. "I would have liked to have had one to give to my mom," Klesko said in a wire story after Game 4, adding later, "It's really important to have her here." And Klesko wasn't done. He hit another home run in Game 5, further realizing the promise that scouts, and his mother, had seen in him for a long time. Klesko was drafted by the Braves in the fifth round of the 1989 draft. By June 1990, Klesko was being talked about as the Braves' latest can't-miss prospect. "One of the best hitting prospects since Dale Murphy," Atlanta director of player development Bobby Dews told The Associated Press..
Klesko saw his first major league time in September 1992, with another short stint in 1993. "I'm going to try to have another good camp and make it a hard decision for them to send me down," Klesko told The Sun Sentinel in February 1993. 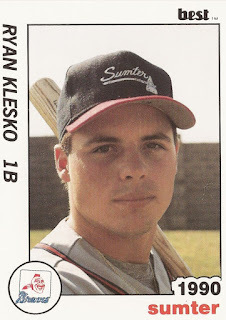 Klesko made the majors for good in 1994. The year after he hit the three home runs in the 1995 World Series, he hit 34 in 1996. He stayed with Atlanta through 1999, when he was traded to the Padres. He stayed with the Padres through 2006, making the All Star team in 2001 and hitting 30 home runs that year. Klesko played his final year in 2007, for the Giants, before injuries forced him to retire. His mom was there all the way, phoning her son each day with an encouraging message, according to The San Diego Union-Tribune. In 2004, he rewarded her with a condo next to Petco Park. "I kept telling him I need a house down there so I can be there and he's always so busy," Lorene Klesko told The Union-Tribune. "Then he came up here one day and said, 'I got you that house you wanted.'"